The last decade has marked a sea change in the breadth, depth, and timeliness of nontraditional data available to investors. Alternative data-which is essentially anything that falls outside the purview of traditional financial or fundamental data-is now ubiquitous in the world of finance. Among traders and portfolio managers, the biggest challenge today isn’t accessing alternative data: It’s managing, prioritizing, and contextualizing all of it to glean real market intelligence from what could easily be information overload. 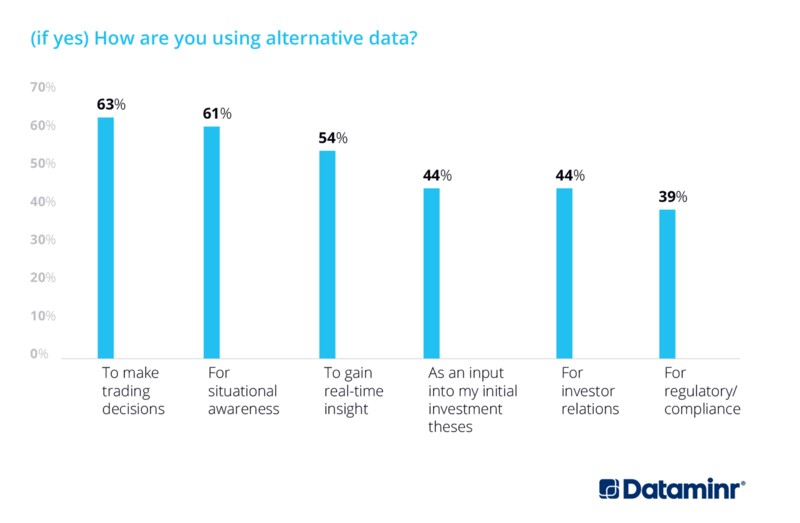 Never has the cliché “separating signals from the noise” been more relevant, as Dataminr’s recent report on how institutional investors use alternative data reveals. In the third quarter of 2018, Dataminr commissioned WBR Insights to survey trading teams and portfolio managers in Europe and North America about their use of alternative data and challenges they face with this new era of information. While the majority of institutional investors—79% of those surveyed—use some form of alternative data, many expressed frustrations with how to translate it into real-time information that is relevant to their trading books and portfolios. Some of the top challenges include a lack of workflow integration, too many data sources, concerns about integrity of information, the wrong type of data, or values that are difficult to understand. Meaningful alternative data can add depth and context to an investment decision, but it is important to understand the variety of data available and how to tap into it. For example, nontraditional data, such as social media and blogs, can be valuable to investment professionals; but monitoring multiple social media platforms on one’s own is a daunting task. That is why many are turning to third-party resources that curate data from many different sources in order to find the proverbial needle in a haystack. Similarly, taking full advantage of alternative data also requires pinpointing actionable information that is relevant to specific securities, sectors, regions, or investment themes of most interest to one’s clients—and integrating that information into existing workflows. Here’s how trading and portfolio management teams can unleash new value from a variety of alternative data to ensure that it does not distract or detract from the investment process. Finance professionals are now privy to alternative information offered by hundreds of data providers, slicing and dicing everything from satellite images and credit card data, to cell phone geolocation tracking and weather patterns. Not surprisingly, firms are spending a greater share of their information budgets on alternative data; the survey of traders and portfolio managers found that nearly 30% of firms are spending more than $2.5 million dollars. In particular, social media represents a vast universe of data. Survey respondents ranked social media, in aggregate, as the number one source of breaking news, above wire services and third-party aggregators. Investors need not look further than the “funding secured” Tweet from Elon Musk in September to see how a single social post can make a significant impact on securities. Although alternative data isn’t necessarily the primary driver of investment decisions, more and more professionals are using it to add context to their decisions and enhance situational awareness to better manage risk or spot opportunities faster. For most investors, the real value in alternative data isn’t always in one data point. On the contrary, the optimal value of alternative data takes root in combining multiple points from a variety of sources so users can derive meaningful insights—and avoid the risk of false signals. Increasingly, traders and portfolio managers are turning to third-party experts to identify meaningful shifts and connect the dots across multiple sources. Of course, it’s one thing to connect the dots and quite another to connect the right dots. What is meaningful to an equity trader covering consumer goods, for instance, may be of little use to someone focused on emerging market bonds. As such, the potential of alternative data is increasingly about giving investment professionals access to tools that allow them to pinpoint exactly what information is relevant to them. Through such technology as machine learning and predictive analytics, it is now possible to gather and analyze nontraditional data en masse. Moreover, third-party firms specializing in data discovery are able to spot patterns based on past events, cross-reference alternative data with traditional sources, and understand the relevance of news, trends, or events to specific segments of the market. Given how much information traders and portfolios are already balancing, how alternative data is delivered is, arguably, equally important. Traders and portfolio managers already multi-task, often using multiple monitors simultaneously to track critical information. In order to gain the greatest value from new data sources, firms need to think about how to integrate alternative insights into existing workflows. While investors need to be alerted to relevant signals, in most cases these should be delivered as “taps on the shoulder” and links to additional information, such as photographs, commentary, or video, so that investors have fuller context. The holy grail is to combine traditional and alternative data points to alert investors to events as they unfold, or to flag interesting business developments earlier—in a way that does not distract or detract. About Dataminr: Dataminr provides an AI-enabled platform that discovers, distills and alerts on activity across publicly available data sources, enabling financial professionals to know and act on market-impacting events earlier. Author: DataminrAbout Dataminr: Dataminr provides an AI-enabled platform that discovers, distills and alerts on activity across publicly available data sources, enabling financial professionals to know and act on market-impacting events earlier.